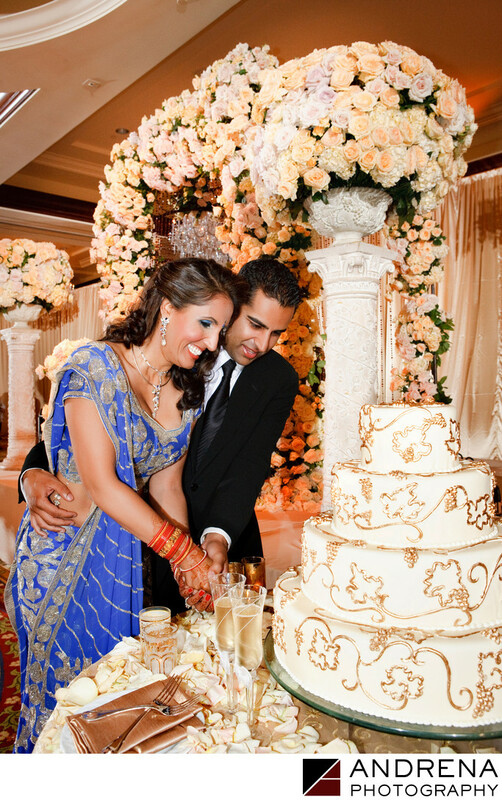 This beautiful Sikh wedding took place at the Four Seasons Westlake Village. The bride wore red for her ceremony, but her blue reception lengha proved to be a truly stunning complement to the gold and cream reception decor. The dance floor was a gold circle, and the sweetheart table was topped with the cream floral arch that had also been used a the ceremony. Most Sikh ceremonies take place in a Gurdwara (a term which actually means "gateway to the guru"), as this is where the Guru Granth Sahib (or Sikh holy book) usually resides. On rare occasions, the book is allowed outside of the Gurdwara for wedding ceremonies. There is a process for bringing the book into a new location, and a process for taking the book out of the non-Gurdwara location. As any experienced Indian wedding photographer knows, it is not permissible to turn your back to the book. Thus, when photographing a Sikh wedding in a Gurdwara or in a another location, all vendors must take care to honor the Sikh holy book, and to not turn their backs on the book while working. I loved this bride's blue lengha, as it looked stunning against all the gold and cream reception decor. This wedding was published in Ceremony Magazine. Indian wedding photographed at the Four Seasons Westlake Village in Westlake Village, California.